This week the August issue of Prevention Magazine will probably hit the news stands. I can’t wait to see how the article and the photos turned out. I have stayed in touch with the other two ladies that are also featured in the article via facebook and email and we are all anxious to see it. Check out more about the article and photo shoot here. That being said I’m at a point where I have to come up with a new goal to get back on track and stay motivated to continue my weight loss/fitness journey. 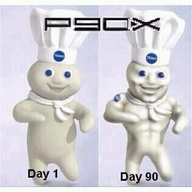 So after much thought (and laziness)…I have decided to do a P90X/Running Hybrid for the next 90 days. Why am I telling you this? So that you can keep me accountable. It is so much easier for me to stay motivated when I have a set schedule and when I have people watching and asking me about my progress. Maybe it will also motivate someone reading this as well. If so, let me know! We can hold each other accountable. 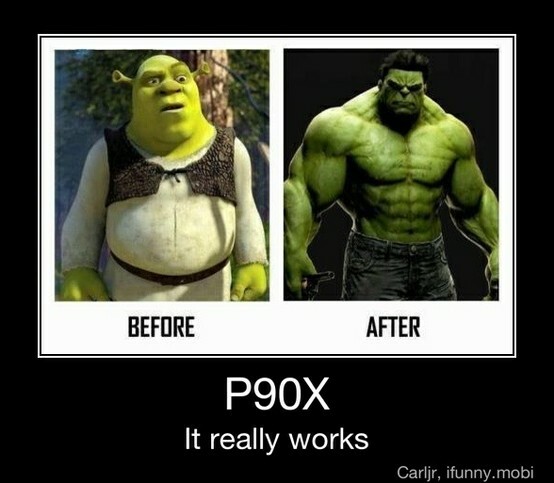 If you have never heard of P90X then you have never watched infomercials. The infomercial is always on day and night. Find it and watch. It is real and these people really do get the results you see. How do I know? Well, I bought Matt the DVD set several years ago after getting tired of watching him watch the infomercial all the time. The DVD’s sat on a shelf for a couple years until Matt came across this guy 2 years ago right after he had completed his first 90 days and the results were insane. His name is Coach Wayne. He is a great inspiration and gives all the credit to Jesus Christ which is another reason we like him. Check out his story and results on his website www.teamripped.com. Matt has actually spoke to him on the phone and has followed his blog since the beginning. Matt and I both have done P90X a few times through but I will admit I didn’t give it my all and usually by the 3rd month I was sick of watching the DVD’s and hearing the same lame jokes. However, the program works and this time I’m going to do it. If you want to know more about what P90X is click here. Along with following the P90X schedule I also plan on continuing to run 3 times a week and I will be following a clean eating program (more on that later). It’s only 90 days. I can do this. I will keep you posted along the way and if anyone wants to join me let me know! I’m going to sign up for a race at the end of these 90 days for the grand finale. Not sure which one yet but I will keep you posted. Here are a few results photos for you. Enjoy! Next postFires, Prevention and Harrison Ford!? I wish I could afford the p90x program. I would try to do it with you. Break a leg, just don’t break any more feet.